universities, the missing link between SMEs and the academic area will be bridged. 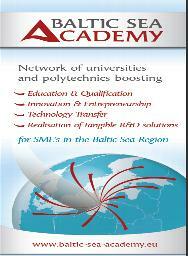 The Baltic Sea Academy will be mainly active in the fields of education and qualification, but at the same time deliver innovative solutions for individual companies. - 41 associated organisations support the implementation of the project, i.e. 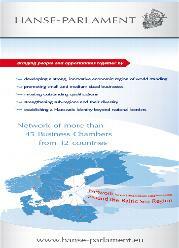 The project is part-financed by the INTERREG IV B Program (Baltic Sea Region) of the European Union, ERDF and ENPI. The total project budget amounts to 3.6 Million Euro. The project started on 1st of January 2010 and will run until 31st of December 2012.
trainings and further education measure offered to SMEs. Additionally several hundred R&D solutions and business plans will be developed. The network of the “Baltic Sea Academy”, with so far 15 universities cooperating, will be expanded and established as a legal entity to ensure its ongoing work also after project duration. The project was initiated by the Hanseatic Parliament, that works closely together with the Baltic Sea Academy in all working fields.